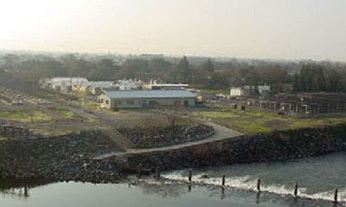 The salmon ladder at Nimbus Hatchery in Rancho Cordova will open on November 1, signaling the start of the spawning season on the Sacramento River. Department of Fish and Game (DFG) hatchery workers will take more than a half million eggs during the first week alone in an effort to ensure the successful spawning of the returning fall Chinook salmon. The three major state-run hatcheries in the Central Valley - Nimbus in Sacramento County, Feather River in Butte County and Mokelumne in San Joaquin County - will take approximately 38 million eggs over the next two months in order to produce a total of 24 million Chinook salmon for release next spring. Each hatchery has a viewing area where visitors can watch the spawning process. At Nimbus and Feather River hatcheries, thousands of schoolchildren tour the facilities each year. The visitors' center at Nimbus Hatchery includes a playground with replicas of giant salmon that are enjoyed by young and old alike. For more information about spawning schedules and educational opportunities at each hatchery, please visit the DFG website. Around the state, there are eight state-run salmon and steelhead hatcheries, all of which will participate in the salmon spawning effort. Those hatcheries, along with federally run hatcheries, will together be responsible for the release of 40 million juvenile salmon into California waters. These massive spawning efforts were put in place over the last 50 years to offset fish losses caused by dams that block salmon from spawning in historically used waters. Today, hatcheries are multimillion dollar operations that employ scientific methods to spawn, rear and return healthy young salmon to various river systems each year. At each hatchery, a team of managers and staff monitor the progress of batches of eggs that will become tomorrow's returning salmon, while pathologists work with each hatchery to ensure fish health. Once the young salmon reach 2 to 4 inches in length, one quarter of stock will be marked and implanted with a code wire tag prior to release. DFG biologists use the information from the tags to chart their survival, catch and return rates.